This project will be a Slow Stitching project over the next few weeks. Today, I’ll show the overall plan, and will update as I get farther along. Someone asked me recently how many projects I have going on at any one time, and the answer is usually two or three. I’ll have something next to my chair to fiddle with while watching TV, a quilt on the longarm to quilt, and a project on the sewing table. Right now, I have two at the sewing table, as I am still making units for Scrap Dance Tango, and I am starting another charity quilt. I have a lovely stained glass quilt on the longarm, and two more charity quilts in the queue. This project has made it up to the hand work stage. 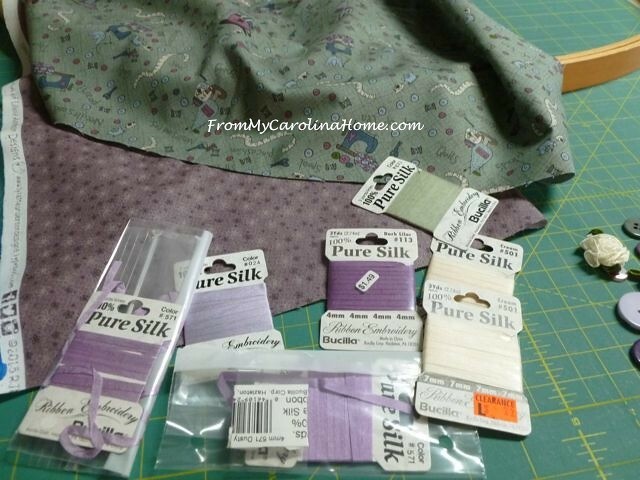 I started with these lovely fabrics. I like the purple and green. 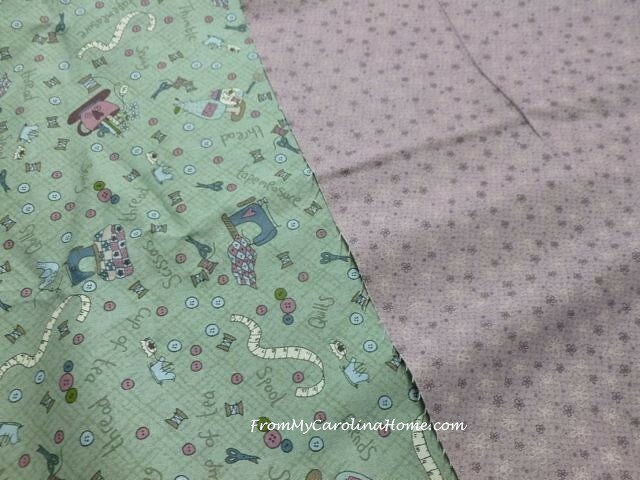 This will go in the sewing room when I am done. 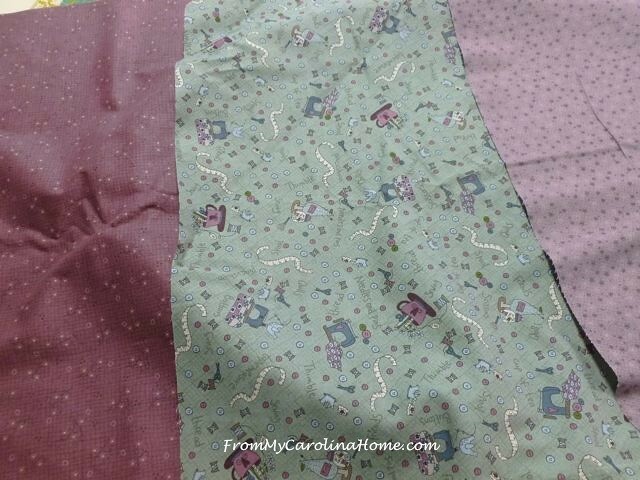 Isn’t this a cute sewing print? Then I brought out some lace doilies and pieces. Rummaging through the button boxes…. 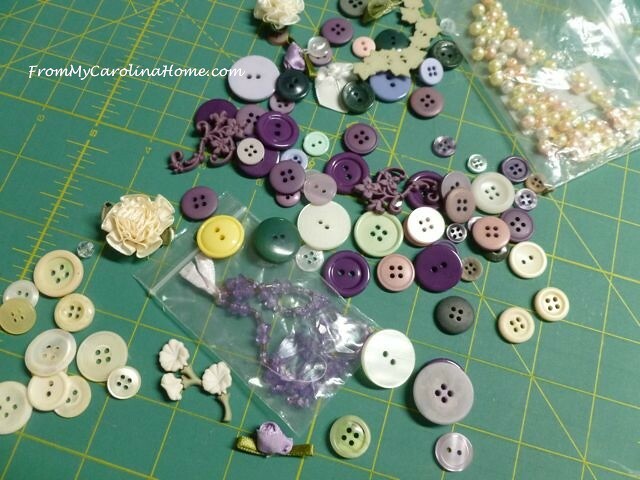 I pulled out purple, green, white, and yellow buttons. I had some pearls, large beads and flowers I could use too. and found some appropriate colors there too. 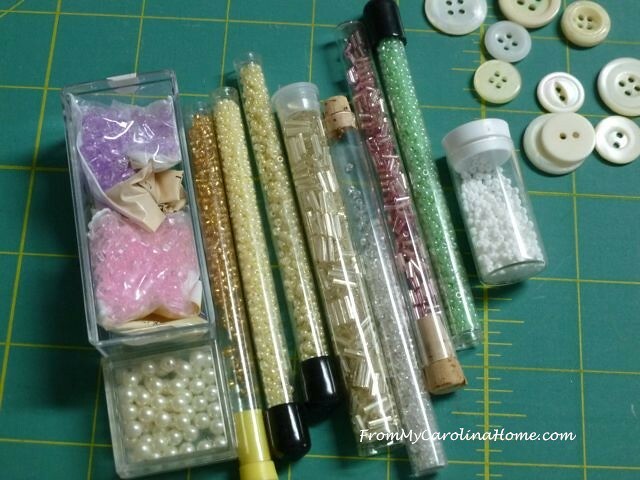 Next, the seed bead stash. The finished art piece will be mounted in a giant quilting frame. After sewing the three pieces of fabric together, I marked the outline of the hoop to define the art space. 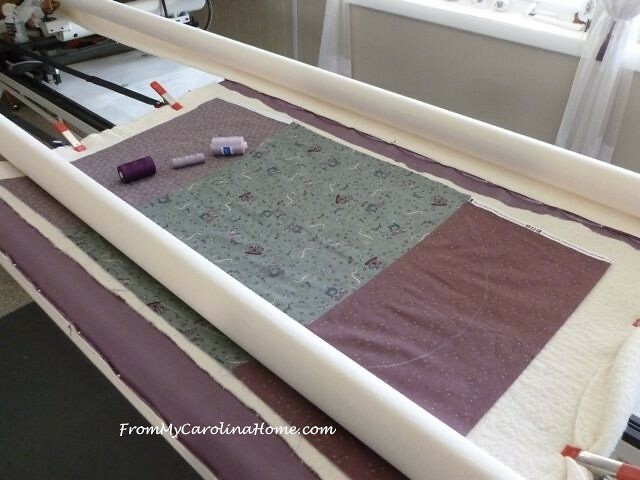 I loaded it onto the longarm, and auditioned various colors of thread. Then, it was quilted with a pansy pantograph. Ultimately, I just quilted the whole piece instead of just the part inside my chalked outline. I decided on these three doilies, can you believe I have a purple one? I pinned them down, and began the hand stitching to secure all three in place. The first two are done, and I have the third one to go. Next up will be to start placing buttons, beads, and silk ribbon embroidery. I am going to let this evolve as it will, no real plan right now. Linking up with Slow Stitching Sunday last fall was very motivating to get the ornaments done. I plan to do it again, in the hope this will be the same, making progress of some kind each week. See the next post for the continuation of the project HERE. Do you work on intricate projects over time? Such a wonderful collection of embellishments to enjoy… can’t wait to see how this evolves! Very beautiful. I love the colour combination. Have a wonderful day !! Wow, all the creative stash eye candy! 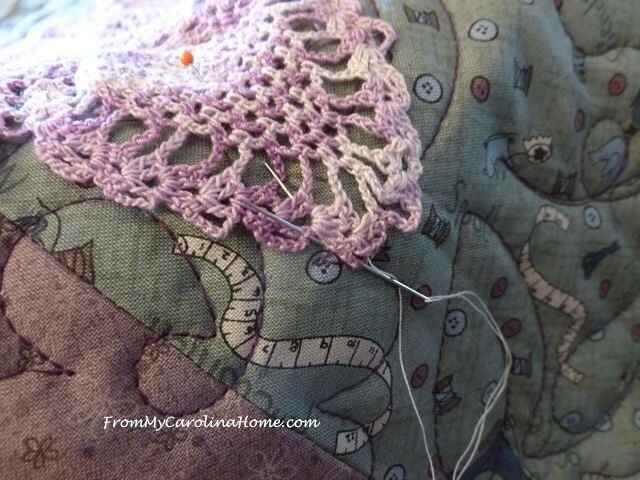 I’m interested in seeing where this is headed so hope you’ll continue to post the progress at Kathy’s blog for SSS. Good Morning Carole! This is going to be a pretty piece of art when you are finished with it. 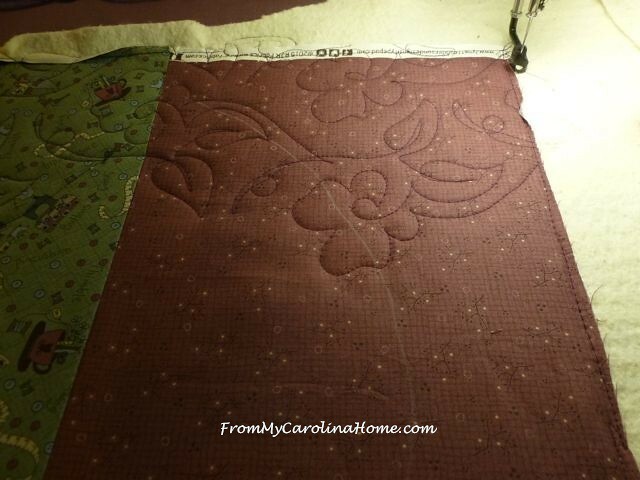 The quilting you chose to do is beautiful! 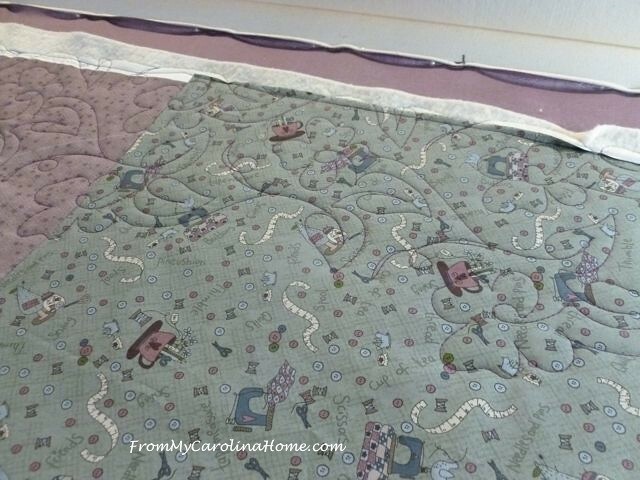 I think I would have quilted the entire piece also! There is usually a hand embroidery project for evenings or just quiet times and one or two quilting/sewing projects going on also. Lately, like the past year, it seems that I have about six to a dozen projects of each going on some almost finished while others are just barely started. I really do not know how I started on this turn of events, but sure am not happy with myself for doing it. LOL. So slowly am working to get each done and back to a normal routine for me. Have you ever gotten so excited about projects that you ended up starting far to many without finishing them? 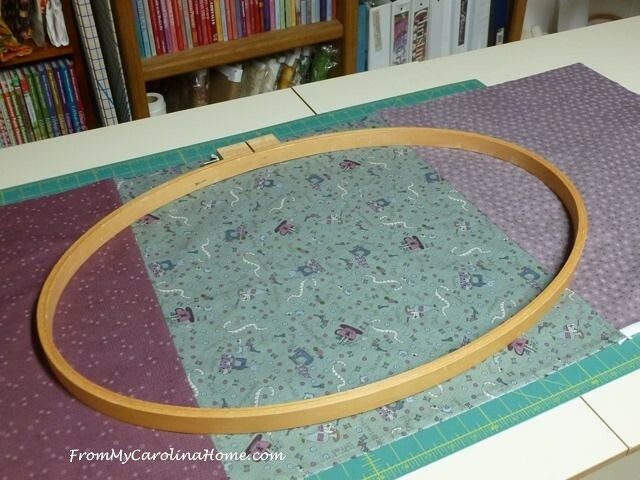 I have an extra large hoop hanging on a wall waiting for a project, such as the one you are doing or a few other ideas have come to mind…but they are fabulous for out of the ordinary projects that become extra beautiful wall hangings. So, I am really looking forward to seeing what all you are going to do with yours! By the way, yes, I do love the the sewing fabric you chose it is adorable! 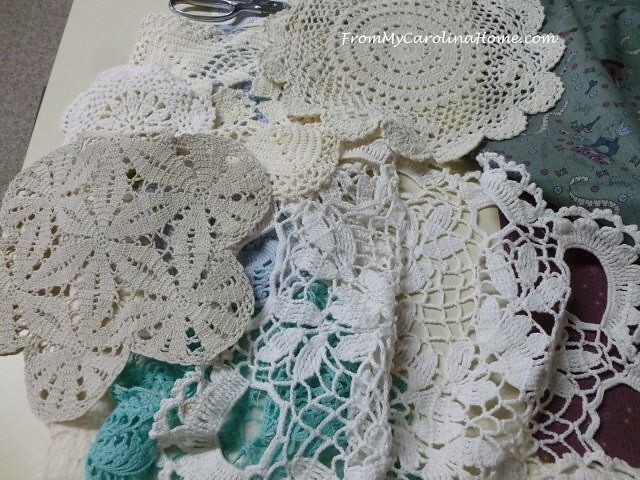 The doilies you are using are they special ones to your heart or ones that have been picked up at garage sales and such. Either way, I had never thought to use them like this and it really is a brilliant idea and a way to really show off the intricate beauty that they have and the special skills it takes to make them! I am rambling….LOL….can not wait to see more! Hope you do get a few more snow days! Have a fantastic creative day! I look forward to watching how this piece unfolds, I have a few crazy hearts to embellish and will start scouring my beads, buttons , lacey trims and ribbons this week. I love that you don’t have an exact plan to mind for this. I was so glad when I decided to join Kathy’s Quilts for the slow Sunday it one of my best motivators. Love the fabrics you are using. Happy Stitching. Very pretty and so feminine…. Haven’t got a long term project in process at the moment have done some in the past…. 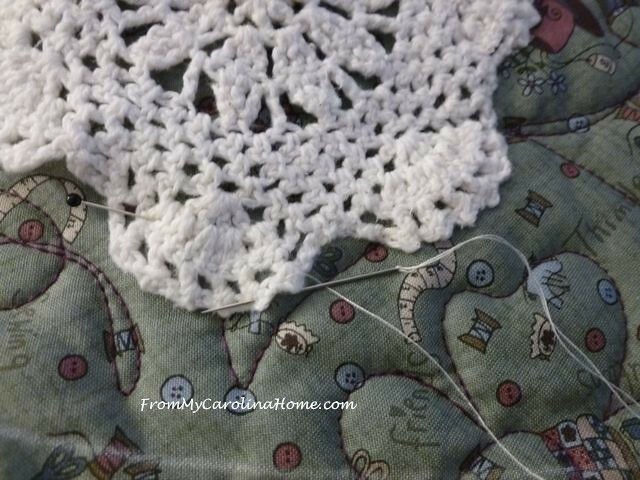 Do have a crochet work that I play with in the evening…. Oh my goodness, I have a colored doily that I have had now idea what to do with as it doesn’t match my decor. Now I have an idea. I am looking forward to seeing where you are going with this. 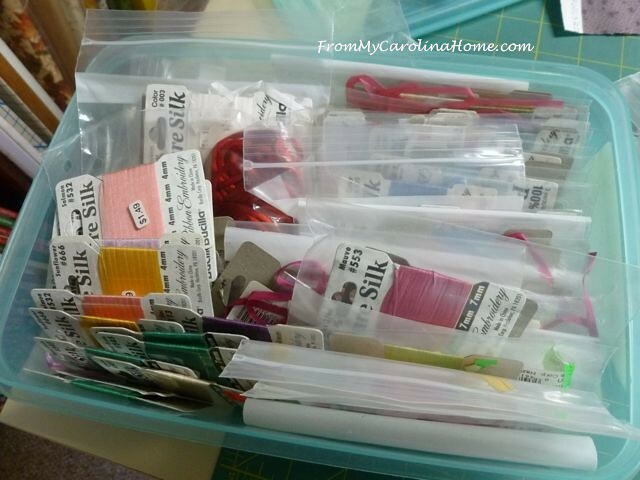 I can also see that you have a wide variety of stash objects (beads, ribbon, doilies and fabric) Wow. Such pretty colors you are playing with. What a lovely piece of art you are making. Always enjoy seeing your creativity at work! Happy Valentine’s Day!! I can’t wait to see the progress on this one. You have a great stash of goodies to chose from. 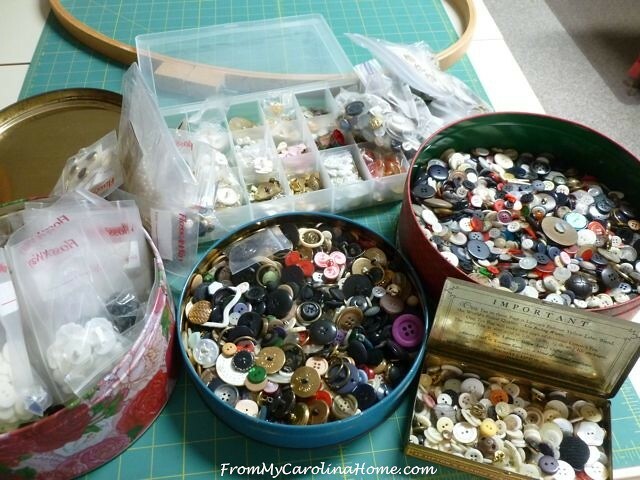 I am so jealous of your fabulous button collection!!! I’m interested in how you are going to do the ribbon embroidery through the quilted fabric. 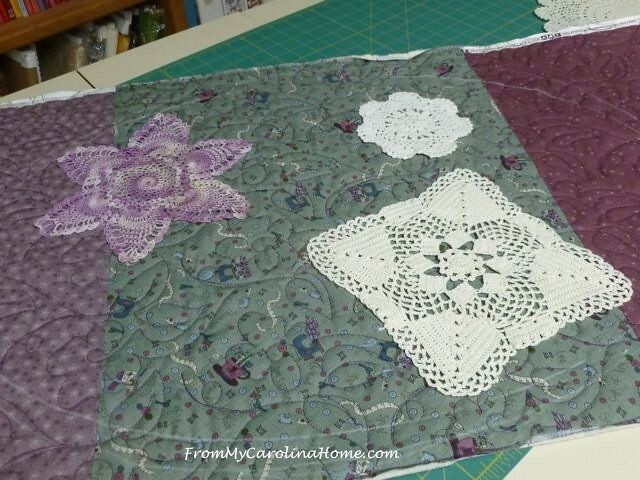 I am just learning ribbon embroidery; my first crazy quilt block is almost completed. I was wondering how these blocks are quilted. I like the idea of quilting them first. Lovely project! Such an awesome collection of embellishments from which to choose! Great start on this project…leaves me hungry for more!